Some quarterbacks seem to master the NFL right away. Guys like Deshaun Watson and Baker Mayfield come to mind. It’s OK if we give other NFL quarterbacks more than a minute or two to find their way. Especially those who might have been stuck as a rookie with a horrible team and worse coaching staff, then had to learn a very complex offense in Year Two. In other words, it’s too soon to know what the Chicago Bears have in Mitch Trubisky. Trubisky had his good moments as a second-year quarterback, and he struggled in other games. But Bears coach Matt Nagy sounds pleased with where he’s at. A long story by Dan Durkin of The Athletic discussed where Trubisky stands going into his third season. Because quarterbacks are treated like instant oatmeal and we want to know exact answers on 23- and 24-year-old quarterbacks after a small amount of games, it’s generally not acceptable to refer to things like a developmental plan and a process. But the Bears understand it might take some time. Trubisky had a longer road than most. He had only 13 college starts at North Carolina before the Bears made him the No. 2 overall pick. He was playing with no-name receivers under coach John Fox as a rookie. Then Nagy came in with as expansive of a playbook as the NFL has. Trubisky was challenged, and Nagy feels he did just fine. 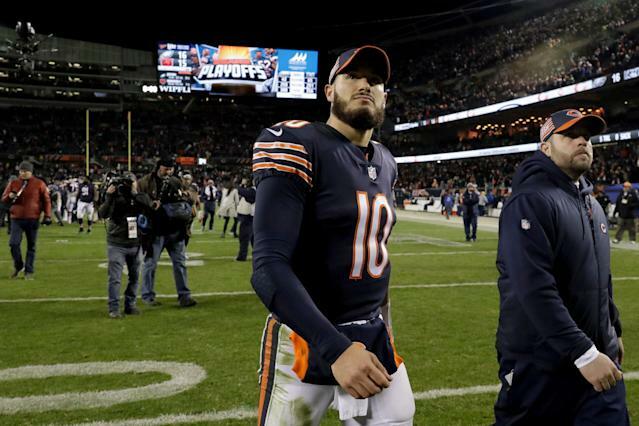 Consistency will have to come sooner than later — there is the whole matter of that five-year rookie contract, and the question of whether Trubisky will be worth a massive extension — but the Bears are good with where he’s at now. Trubisky was named as a replacement in the Pro Bowl last season. He was very good running the ball. He threw for 24 touchdowns with a solid 95.4 passer rating. The Bears won the NFC North mostly behind a great defense, but Trubisky did his part too. And this season he’ll be asked to do more. Nagy told The Athletic he will have times in OTA or training-camp practices in which he lets Trubisky take over play-calling for a whole series. “I couldn’t do that last year, because he didn’t know what to call,” Nagy said. Trubisky is one of the more interesting players heading into the 2019 season. Given his draft pedigree and his best work last season, it’s conceivable his next step forward will be a big one. If that happens, the Bears still have a great defense, innovative coaching staff and good skill-position players. If the Bears are going to be a real championship contender, a lot rides on Trubisky. And we don’t know yet what he’ll be.